A smaller entry this week sold to a good steady demand with store heifers selling to £1,040, £208 per 100kg. Store bullocks selling to £1,000 for a 560kg Aberdeen Angus (£178). Weanling males selling to £1,000 for 470kg (£213) with smaller ones to £339 per 100kg for a 180kg Charolais to £610. Weanling heifers selling to £865 (£196) with smaller ones selling to £310 per 100kg for a 200kg Charolais to £620. Rosslea producer 500kg Charolais to £1,040 (£208), Corranny producer 500kg Charolais to £1,000 and 470kg Charolais to £990. Lisnaskea producer 530kg Charolais to £885. Lisnaskea producer 480kg Belgian Blue to £865. Magheraveely producer 480kg Aberdeen Angus to £870, 480kg Aberdeen Angus to £850 and 450kg Aberdeen Angus to £800. Maguiresbridge producer 460kg Aberdeen Angus to £800 and 460kg Aberdeen Angus to £790. Magheraveely producer 560kg Aberdeen Angus to £1,000 (£178) and 480kg Aberdeen Angus to £850 (£177), Lisnaskea producer 530kg Belgian Blue to £980, 610kg Montbeliarde to £915, 510kg Hereford to £900 and 440kg Hereford to £840. Lisnaskea producer 490kg Charolais to £800. Lisnaskea producer 470kg Charolais to £1,000 (£213), 380kg Charolais to £930 (£245) and 430kg Charolais to £890. Rosslea producer 450kg Charolais to £990, 450kg Charolais to £925 and 460kg Charolais to £900. Lisnaskea producer 420kg Charolais to £955 (£227), 410kg Charolais to £955, 410kg Charolais to £910 and 360kg Charolais to £820. Lisnaskea producer 390kg Limousin to £935 and 340kg Charolais to £800. 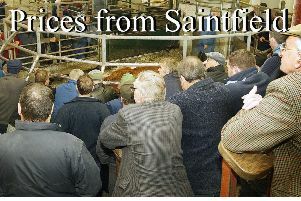 Maguiresbridge producer 360kg Limousin to £890 (£247), 360kg Limousin to £785 and 300kg Limousin to £700. Lisnaskea producer 380kg Limousin to £855 and 400kg Limousin to £780. Springfield producer 330kg Limousin to £855, 320kg Charolais to £850, 280kg Limousin to £770 and 270kg Charolais to £745. Belleek producer 330kg Charolais to £820 (£248), Maguiresbridge producer 280kg Charolais to £790 and 290kg Charolais to £745. Newtownbutler producer 410kg Hereford to £790, 350kg Hereford to £765 and 370kg Hereford to £760. Bellanaleck producer 300kg Limousin to £785, 250kg Charolais to £700 and 250kg Limousin to £690. Derrylin producer 360kg Limousin to £770, 270kg Limousin to £730, (£270) 290kg Limousin to £705 and 300kg Limousin to £700. Fivemiletown producer 330kg Limousin to £740, 300kg Limousin to £720 and 310kg Limousin to £705. Derrylin producer 250kg Charolais to £730 (£292) and 280kg Charolais to £660. Garrison producer 270kg Charolais to £715, 280kg Aberdeen Angus to £690, 250kg Limousin to £670, 210kg Limousin to £645 (£307), 230kg Limousin to £645, 240kg Limousin to £635, 230kg Limousin to £625, 270kg Aberdeen Angus to £610, 210kg Limousin to £605, (£288) 230kg Limousin to £575, 200kg Limousin to £575, 230kg Limousin to £575. Fivemiletown producer 280kg Charolais to £700, 280kg Blonde d’Aquitaine to £685, 240kg Charolais to £670, 290kg Shorthorn to £655. Derrylin producer 250kg Charolais to £700 (£280) and 180kg Charolais to £610 (£339), Aghalane producer 280kg Limousin to £700, 220kg Limousin to £585, 230kg Aberdeen Angus to £555, and 220kg Charolais to £475. Rosslea producer 280kg Limousin to £695 and 220kg Limousin to £490. Leggs producer 270kg Charolais to £690 and 250kg Charolais to £650. Lisnaskea producer 280kg Simmental to £680 and 250kg Simmental to £655. Rosslea producer 440kg Charolais to £865 (£196), Lisnaskea producer 380kg Charolais to £840 (£221), Lisnaskea producer 330kg Charolais to £840 (£254) and 340kg Charolais to £800. Rosslea producer 370kg Charolais to £805, 370kg Charolais to £800, 370kg Simmental to £795 and 330kg Charolais to £730. Lisnaskea producer 340kg Charolais to £795, 360kg Charolais to £795, 340kg Charolais to £790 and 340kg Charolais to £785. Fivemiletown producer 330kg Limousin to £760, 300kg Charolais to £725, 300kg Charolais to £720, 260kg Charolais to £625, 250kg Charolais to £595 and 260kg Charolais to £560, 250kg Charolais to £595, Springfield producer 280kg Charolais to £745 and 250kg Limousin to £570. Derrylin producer 320kg Limousin to £730, 300kg Limousin to £690, 280kg Limousin to £645 and 260kg Limousin to £600. Maguiresbridge producer 310kg Limousin to £740. Fivemiletown producer 350kg Limousin to £715 and 240kg Limousin to £480. Ballinamallard producer 250kg Limousin to £675 and 210kg Charolais to £595. Lisbellaw producer 370kg Limousin to £670 and 240kg Limousin to £525. Mackin producer 330kg Charolais to £665. Leggs producer 260kg Charolais to £655, 280kg Charolais to £635 and 260kg Charolais to £635. Garrison producer 230kg Charolais to £655 (£285) and 200kg Limousin to £620 (£310), Derrylin producer 300kg Charolais to £625 and 280kg Charolais to £550. Belleek producer 260kg Charolais to £620 and 250kg Charolais to £605. Aghalane producer 220kg Aberdeen Angus to £565, 240kg Limousin to £540, 230kg Limousin to £540 and 230kg Aberdeen Angus to £535. Kinawley producer 190kg Charolais to £495.